Janna Hill was randomly selected to win a horror library with nearly 70 signed books from some of the genre’s biggest names! These social media buttons allow you to share our posts and horror selfie submissions through your social networking accounts. The individual who submitted it said it's okay to share. Help us spread the word to promote literacy and the horror genre! Wonderful! Congratulations to you, and to you, and to you – Sorry, I thought I saw a few Ghosts cheering around you, too….Horror has its audience in the unknown, you know. On the serious side, really, great you’ve won and hope every page of every book reminds you how great it is to be like a child – afraid – with a flashlight under the pillow for those scary sounds in dark-filled corners. Thank you Norma. I am surrounded by ghosts so you may have seen one or two. I do find myself [anxiously] watching for the mail. Great! Wonderful that you responded because I wanted to warn you to watch out for any Ghostbusters that may try to scare away the mailman! And, don’t forget, take a Horror Selfie with your prize books! Thanks again Norma. I forwarded some photos to Tom Calen and used them as thumbnails on the videos I posted where I share the titles of each one @ https://www.youtube.com/user/jannahill. By hitting the "submit" button, you agree to the HorrorSelfies.com comment policy. 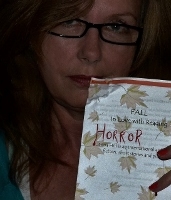 © 2014 -- HorrorSelfies.com is brought to you by The Horror Writers Association.